Please click a war rug's picture, title, or number for details. Strong design. Note the superb luster of this rugs wool. Design alternates between rows of two tanks with text inside and three large ewers. Throughout the negative space sit grenades and small flowers, and the whole field is surrounded by an open guard stripe of linked flowers and leaves. Excellent new condition. Like the other Red Rugs currently available on WarRug.com these rugs have been in a dealer's warehouse since they were woven in 1990's. The green and red combination in this rug makes it unique and outstanding. Also the small patterns within the different images tie the whole rug together. Also the small tanks are one of the best images in all red rugs. This rug features a detailed map of the world, complete with names of each country, oceans, and labeled latitude and longitude lines. The eastern end of Russia and New Zealand are featured twice on the map, once on the right side and again on the left where it wraps around. This classic Herati design features a large blue polygonal Lozenge filled with the classic 'fish like' diagonal patterns. The spandrels contain small persian lion figures alongside tanks, rifles, and small medallions. The center of the rug features a plus-shaped medallion containing a large stylized jet and a mounted gun with two smaller rifles and medallions. The border on this rug is interesting. Important early landscape rug from a good collection, but a dealer who shall remain nameless, 'tea washed' it. This rug features a landscape with two large gridded minarets, possibly the Minaret of Jam. Smaller buildings sit throughout the rug with tall towers while a road snakes down the center. At the top and bottom of the rug sit faded subtle areas with mountains packed with helicopters and planes. Although this rug has been washed, the bright orange and red are still vibrant and the overall color scheme of the rug is really nice. The deep blue base of this rug is intertwined with beautiful dark brown figures of planes and cars. However, the contrast provided by the bright pink threading is the real standout aspect of the rug. The vibrance of the pink gives life to all the images contained within its boundaries in a way that is incredible and adds greatly to the overall quality of this piece. Very rare rug in excellent condition. Please contact us for the price. The F-16 jets in this rug are actually labeled 'F 16' (albeit backwards) making this a very unique rug. The border is an interesting floral pattern with alternating green branches and small bunches of red and green flowers. This is a new design in the past few years. Nigel Lendon, Max Allen and Kevin Sudeith have debated the monument shown. Sudeith maintains that it is a recently built monument built in a traffic circle in Herat, Afghanistan. Several rugs in our most recent shipment show this monument from several angles. This rug, and one similar example (link), are the best. The helicopters in the top right corner are unique to these two carpets. The helicopters ad excellent scale to whole rug. The emerald green in the cars in the foreground unusual material and doesn't feel like wool. The same material is marled into the first green and tan line on the top edge of the foreground roadway. The variety of marled colors give depth to pictorial space in this landscape rug. The geometric renderings of buildings is particular to these pictorial rugs from western Afghanistan. Simply put, this rug (and its mate) are the best contemporary war rugs. This rug is great design with timely imagery. This rug is very unusual. The wool is very good. The design is unique. It appears to be an adaptation of designs like This war rug #1465 or Plate 36 in Kevin Sudeith's first book about war rugs.. The large clock is unusual relative to similar designs. The white of the tower from which the clock hangs is understated. The foreground of this rug is abstracted, and there are war motifs like helicopters and rifles, scattered throughout the foreground. The structure of this rug is reminiscent of rugs like war rug #26. It is possible that both of these rugs represent the work of the same weaver some 10 years apart. The washing of this rug was not totally successful, for one can see some red discoloration in the lighter tans and whites, please see photos. Also note the light purple is an old fashioned analine dye, and significantly tip faded. Most synthetic dyes used in carpets today are no longer analine, but my understanding is that the particular purple in this rug is analyne. Condition notes aside, this is an interesting rug. The wool is better in these second generation Large Tora Bora rugs. The initial group laid flat, but the wool was lesser quality. This wool is fluffier and stands up better. Along with the pattern, there are speckled green mountains. The three large medallions running down the center of this rug are typical of this style of rug. Brown fighter jets run down the sides of the medallions (the jets on the bottom have been compressed) between squares of color. 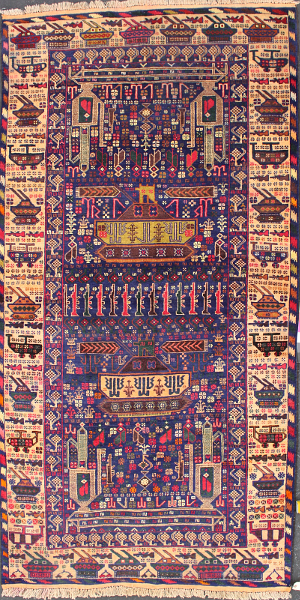 This two ewer war rug is marked with two large tanks in the center and a row of red, brown, and green rifles dividing the two halves of the rug. The checkered coloration of the ewers is echoed in the design and coloration of the grenades in the smaller intricate border. Detailed drawings of tanks, rifles, and helicopters form the main border on a pale yellow background. This is an early example of this important design, but it has several areas of repaired damage. A very interesting view of possibly the Kabul airport and the surrounding cityscape. In the center of the rug is a curiously grenade-like shape, almost like a grenade with its pin pulled. 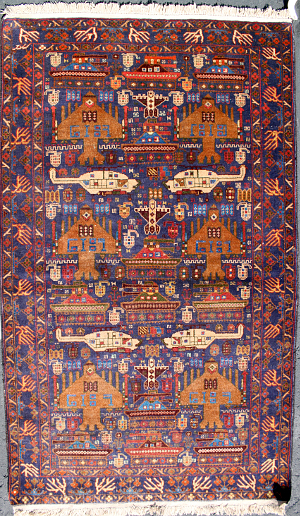 Planes and helicopters sit around the center on a blue background, and the top and bottom thirds of the rug depict an almost mirrored view of the surrounding town. The border includes some possibly Greek-inspired blue, olive, and white designs. This rug is in new condition. It has been in a series of rug dealers wharehouses since it was woven in the 1990's. Production of Red Rugs stopped in 2003 after Afghan refugee weavers returned to Afghanistan after the fall of the Taliban. The Kalashnikovs in this rug are well drawn and very accurate. The patterning arond the helicopters give a nice effect, as does the drawing on the tanks. The starburst flowers are a nice touch. This is a very busy and textural rug. There is little negative space, rows of tanks, grenades, rifles, and small animals fill most of the space all the way up to the thin zig-zag border. To purchase a war rug please contact or call us at 800-781-0153. Shipping is free to all of the Lower 48 states via ground service. We ship world wide, and we offer express delivery, so please ask for a price quote regarding these services. Sales tax will be added for shipments within New York State (8.875%). International shipments are subject to duty charges in the country of receipt, and recipient is responsible for all duty charges. These are usually collected, C.O.D. at time of delivery. Please consider your local duty charges before ordering. Please call toll free at 800-781-0153 to speak with one of our customer service representatives. all content copyright 1996-2004 merchant adventurer/warrug, inc.